A major suspect of a piracy ring in North America involved in the illegal duplication and sale of Ghanaian musical works and videos was arrested in Accra last Wednesday. Emmanuel Sarpong, the Ghanaian businessman resident in Canada who is in the centre of the piracy scam, is believed to be the biggest Ghanaian music pirate in North America. He is alleged to have pirated the music of 42 Ghanaian musicians within the last one year alone.His victims have included Kojo Antwi, Daddy Lumba, A.B Crentsil, Paapa Yankson, Tagoe Sisters, VIP and Tic Tac. Others are Nana Quame,Amakye Dede,Kaakyire Kwame Appiah, Jude Lomotey,Adane Best, Obour, Buk Bak, Pat Thomas and Abrewa Nana. Sarpong is also alleged to have pirated the only recently released DVD collection of Kojo Antwi as well as the video coverage of the 2004 Ghana Music Awards. Popularly known among Ghanaian communities in Canada as “CD Man” because of his piracy activities, Sarpong is said to be a familiar face at local parties and grocery shops where he operates from his car boot, selling pirated CDs for $5 instead of the regular price of $20. Sarpong's arrest last Wednesday was at the instance of some local artistes and producers in collaboration with the police.One of Sarpong's victims told Showbiz that they were informed by an official of the Ghana Music and Film Association in Europe and North America that Sarpong was arriving in Ghana to see his family at Kintampo. The victim said he informed a couple of other musicians and producers who monitored Sarpong's movements while he was in Ghana. On the eve of his departure back to Canada, he was lured to a restaurant in Accra using a lady's telephone conversation as a bait. On arriving at the restaurant, Sarpong was “welcomed” by his victims instead of a pretty lady. 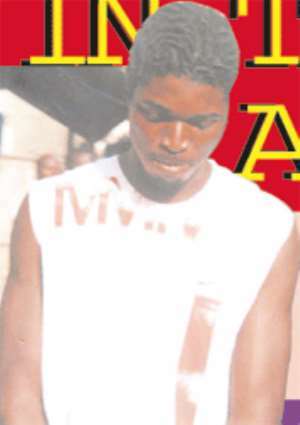 He was arrested and taken to the Accra Central Police Station where he was charged. Commenting on the arrest of Sarpong, the President of the Musician's Union of Ghana (MUSIGA), Alhaji Sidiku Buari commended the watchfulness of the artistes and producers involved in the arrest and also the police. He said that MUSIGA has been able to link up with like associations in Europe and America and they will use that relationship to bring to book businessmen who pirate the works of Ghanaian musicians.